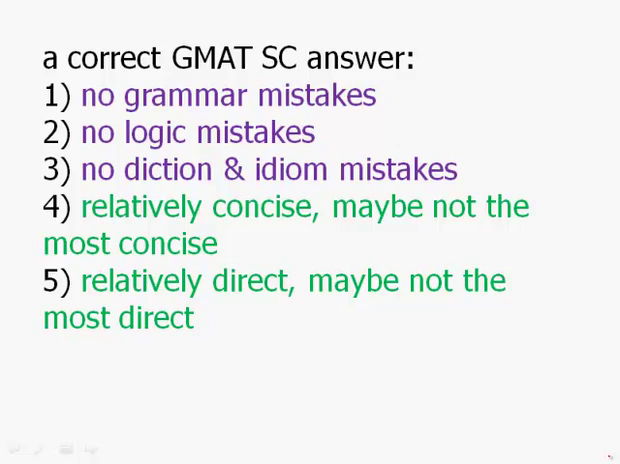 This video is about a subtle point of Sentence Correction strategy, the distinction of ideal versus best answer. What do we mean by this? Well, the goal on the sentence correction is not: find the ideal answer, the most perfect answer possible. That is absolutely not what the directions say. What they say is find the best answer. It may be that there's a better way to say it than is listed among the answer choices. And we can't get hung up on that. We might have in mind, wow the best way to save would be blankity blank but that's not listed among the answer choices. We have to go with the five answer choices we're given and pick the best from among those five, even though it might not be ideal. So what actually constitutes the correct answer? What are we saying here? Well it's absolutely true that a correct answer will have no grammar mistakes, no logic mistakes, and no mistakes in diction or idiom. Those are non negotiable. We can apply a black and white standard. In other words, if it has a grammar mistake or a logic mistake, it absolutely can't be a correct answer. That's very clear. There are other things associated with language that are more in a shade of gray. It's a matter of degrees or a matter of interpretation. For example it's important for the answer to be relatively concise. But it might not be the most concise answer. It's important for it to be relatively direct, but it may not be the most direct answer. A lot of these shades of gray are in the unit that we call rhetorical construction. We'll talk more about that when we get to that unit. But it's very important to keep in mind, do not apply the same standard of black and white to every single thing you learn in the sentence correction module. Sentence correction doesn't work that way. Language doesn't work that way. It's not mathematics. We need to have a little more flexibility. So overall on the GMAT the best answer will be error free but it may or may not be the very best way to convey that information. In other words, it may not be ideal. This is important idea number one. Now, related to this, when you read the prompt you may have your own idea about how to fix the problem. And that's great, in fact that shows a lot of progress if you can read the sentence and right away anticipate what are gonna be good ways place to correct the errors that you see. Here's the catch though, don't be too attached to your version of how to fix the sentence. The basic idea is, there are often a variety of correct way to express an idea. So for example, suppose we were given this prompt. When Sam is able for speaking Chinese and to read Chinese characters, we will take our trip. Well, something sounds a little awkward about this. First of all, notice that we need some parallelism between for speaking and to read. We have two actions here, they ought to be in parallel. And in fact we may remember the idiom, the word able always takes the infinitive, able to do something, that's the correct way to say it, not able for doing something. So we might anticipate, given this, we might anticipate the best possible sentence is, whene Sam is able to speak Chinese and to read Chinese characters, then we'll take our trip. So, now we have this anticipation, unfortunately, when we read the answer choices we don't see that. Our ideal version of the answer is not actually one of the answers listed. So we have, abled for and to, so this is wrong. And then we have able to and then for, that's wrong. And then we have these answer choices, has the ability. Well, that's a grammatically correct way to say it. The word ability, like the word able, also has to have the infinitive, so the ones with for, these don't work. In E, we have able, the ability to speak Chinese and to read Chinese characters, so this is grammatically correct. It's a slightly more awkward or wordy way to say it, in other words, our ideal version would have been better than E, but among these answer choices, E is the best answer. It's the best of the five, and that makes it the correct answer on sentence correction. So overall, keep in mind best does not necessarily mean ideal. Don't get hung up on an ideal, this requires some flexibility. And in particular, as we move through the lessons pay attention to what's negotiable and what's nonnegotiable. In other words, where do we have black and white standards where we can absolutely eliminate things, and where are there more shades of gray where we have to be flexible and make adjustments? And finally, if you have your own idea reading the prompt of how to fix it be ready to adjust your expectations of what the answer should be. Be, the sentence correction loves to build up expectations and then give a correct answer that doesn't meet those expectations. So we have to be very flexible dealing with the answers on sentence correction.